Action, drama, and suspense awaited Staff Sergeant David at the top of Itcha Mountain in British Columbia. A young Air Force special operator and air combat controller, David is coming out of years of rehabilitation after multiple deployments to Afghanistan and resulting injuries from explosions. There, in the wilderness surrounding the small city of Quesnel, this veteran of war experienced an altogether different kind of defining moment—complete with rifle and a seven-foot nearly 500-pound black bear. This was all thanks to Spencer and Sabrina Fraser, and their clever eleven-year-old son, Morgan (who entertains plans to take a seat in the Canadian Parliament when he’s old enough). Almost a year ago, Morgan approached Freedom Alliance founder, Oliver North, at an outdoor conference in Las Vegas. 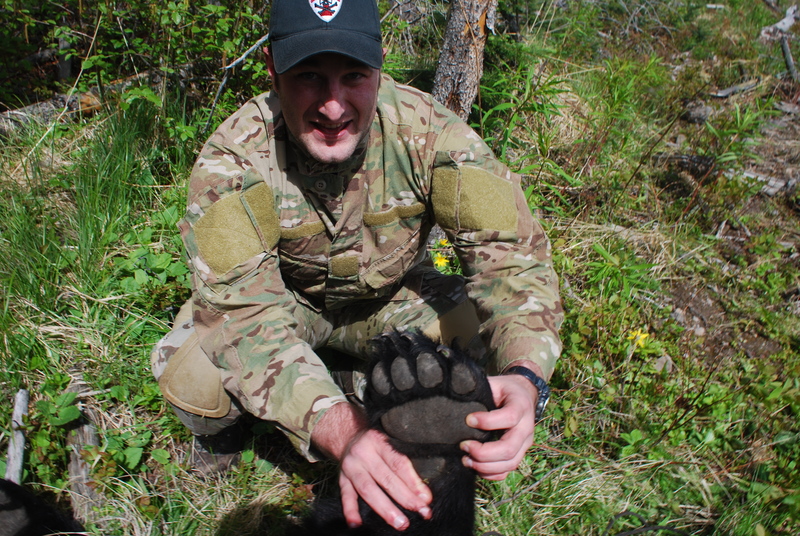 He shared his proposal with Colonel North to invite a wounded service member to his family’s homestead in the mountains of British Columbia for a bear hunt. Freedom Alliance took him up on the offer and found the perfect guy to go, too. To get to the Frasers’ hunting lodge, Itcha Mountain Outfitters, David took a series of flights over stunning views of the snow-peaked Rockies and secluded British Columbian backcountry. The first thing he did upon arrival was head out with Stewart to a rifle range to practice in preparation for the next day’s hunt. Stewart Fraser is a licensed guide, who leads hunters around a 100-square-mile track of highland, comprising pine forests and marine-blue lakes. He explained that bears are most active from 1 p.m. to 11 p.m., and as a testament to his expertise, within two hours of setting out for the first hunt, David had sighted a massive black bear at the crest of a hill. And the staff sergeant surpassed all expectations. He was relieved and thrilled and eager to show his bear back at the lodge. Mrs. Fraser hugged him, and all reflected emotionally on what a grand moment it was—no doubt considering David’s heroic sacrifice while in service for the United States Air Force. The rest of the vacation was spent in leisure—sleeping in, trout fishing, and helping another hunter find a bear. The evenings included hearty meals and storytelling and company. After the zenith of excitement from the first part of the week, a substantial rest was in order.